There’s always a reason to celebrate at Delightful Pastries and June 22 is most certainly no exception. National Éclair Day is June 22. The mini pastry ($30/pound for about 30), made with choux dough filled with custard and a drizzle of icing on the outside, is the perfect cure for anyone with a sweet tooth. Full size éclairs are $4 each. At such a delightfully small size, make sure you buy as many as you can get your hands on. Éclairs, as well as other treats, can be found at all three Delightful Pastries locations: Old Town at 1710 N. Wells St., (312) 255-0724; Jefferson Park at 5927 W. Lawrence, (773) 545-7215, and Chicago French Market at 131 N. Clinton, (312) 234-9644. Visit http://www.delightfulpastries.com for more information. for season three and they are on the hunt for talent! If you think you can stand the heat, sign-up to get in the kitchen! 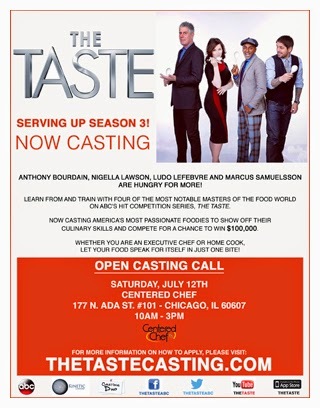 Open casting calls for chefs interested in competing in this culinary competition series will be held in cities across the country starting Saturday, June 21 in Los Angeles. They will be in Chicago 10 a.m. to 3 p.m., Saturday, July 12 at Centered Chef Food Studios, 177 N. Ada St. #101, Chicago, IL 60607. "The Taste" is produced by Kinetic Content who create and produce cross-platform for the multi-genre content for the global television marketplace. Chris Coelen, Sam Dean, Anthony Bourdain, Nigella Lawson and Brian Smith serve as Executive Producers for the show. ABC is an American commercial broadcast television network viewed in the United States and Canada. Throughout its history, ABC has supported its financial operations by diversifying into the press, the publishing industry, the operation of theaters, and filmmaking. As one of the "Big Three television networks", ABC has broadcast many programs that have contributed significantly to American popular culture. These include classic series such as Zorro, The Untouchables, The Brady Bunch, Happy Days, Roseanne, and The Fugitive; more recent titles such as Castle, Lost, Revenge, Desperate Housewives, Grey's Anatomy, and Modern Family; live broadcasts such as Monday Night Football; the reality shows America's Funniest Home Videos, Extreme Makeover: Home Edition, and Dancing with the Stars; and the morning news program Good Morning America. Follow us on Twitter at https://twitter.com/ABCNetwork. There’s another great reason to visit the 65th Annual Old Town Art Fair this weekend, June 14 & 15. Da Lobsta! 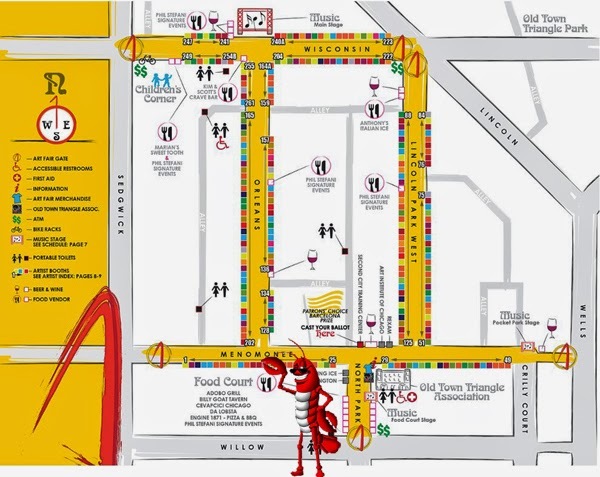 Take a break from strolling the 250 nationally acclaimed artists (100 of whom are new) at one of the best juried art fairs in America and enjoy a delicious authentic Lobster Roll in the heart of the historic Old Town Triangle. 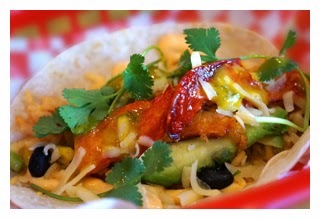 For more information, visit http://www.dalobstachicago.com or OldTownTriangle.com. Throughout his seventeen year career, Executive Chef Paul Choi has developed a multicultural contemporary food sensibility, and he never strays from his commitment to serving creative dishes made from fresh, high quality ingredients. He began his career working as a line cook for acclaimed Chef Shawn McClain at Evanston’s eponymous restaurant, Trio, preparing outstanding contemporary American cuisine. While he worked at Trio in the evening, during the daytime Choi completed the rigorous culinary program at Kendall College where he rounded out his skills with a focus on classical French technique. After leaving Trio, Choi went to work for award winning Chef Kelly Courtney, working virtually every station at OKNO restaurant as he prepared contemporary global cuisine. He then moved to her restaurant MOD where he prepared cutting edge bistro fare. 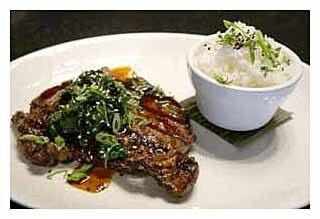 Choi was then appointed Sous Chef at Tizi Mellou, a highly regarded Mediterranean fusion restaurant. In the fall of 2000, Choi was recruited to be the opening Chef de Cuisine for Bistro Marbuzet, a casual French Restaurant in Forest Park. Later he also assumed the same role for Jacks on Halsted, a contemporary American grill, with the same company. 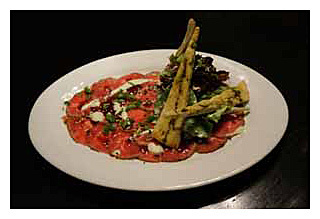 In 2002, Restaurant Development Group (RDG) had a need for a Corporate Chef for their Bar Louie concepts as well as the newly developed Red Star Tavern concept. 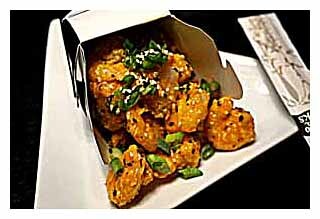 In the short span of two years, Choi oversaw the opening of 28 restaurants in total. Wanting to continue to learn and grow, Choi joined Chicago’s renowned Blue Plate Catering in 2004 to hone his skill in the planning and production of everything from small, private dinner parties to corporate events of 1000. From there he became the Chef de Cuisine of Jordan’s Food of Distinction, a high-end catering company in Chicago. 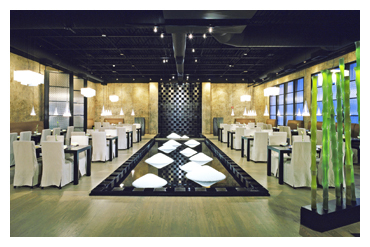 In 2007, Choi was bitten by the bug to open his own restaurant, Sura, located in the Lakeview area of Chicago. Although well liked and well-reviewed, Choi’s Contemporary Korean restaurant could not survive the economic downturn that claimed many restaurants that opened around this time. Looking for a change and matching his love for the outdoors, Choi signed on to be the Chef at Sandy River Lodge in Sandy River, Alaska for the summer fishing season. Returning to Chicago after the season, Choi rejoined the staff at Jordan’s Food of Distinction. However his love of Alaska kept pulling on him and in 2010 he returned, this time to the remote fishing village of Cordova, home of the world famous “Copper River Salmon,” as the Executive Chef and General Manager of the Reluctant Fisherman Inn. After three years he returned to Chicago in August of 2012 for family reasons. Upon his return to Chicago, he accepted the position as Executive Chef at the Chicago Botanic Gardens in Highland Park. There he developed a reputation for providing extraordinary cuisine in both their casual restaurant as well as high-end catered parties for donors and patrons. 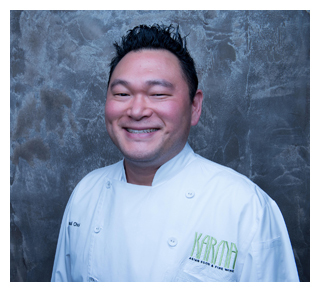 In January of 2014, Choi was selected to be the Executive Chef at Karma Asian Food & Fine Wine. His first task was to retool the menu and incorporate his signature of style of contemporary, clean flavor profiles. Combining his Asian background with his classical French technique, he has completely revamped the menu with guest favorites such as Firecracker Shrimp, Korean BBQ Glazed Ribeye Steak and Sweet Ginger Bread Pudding. Choi appreciates the opportunity that “Asian Fusion” gives him to explore the cuisines of Korea, China and Japan while melding in some subtle American influences. Focusing on sustainability and quality, Choi strives to procure the freshest and best local ingredients possible. He relishes the fact that when people enjoy the food they are eating, it can change their mood and outlook on life. This is a core value that motivates him to continually challenge himself and his staff to provide the most memorable dining experience possible. It may be the French Queen Marie Antoinette who said “Let them eat cake,” but you’ll be thanking the Germans when you try Delightful Pastries’ German Chocolate Cake ($42/8-inch; $5.25/slice). From the kitchen of Delightful Pastries emerges a tried and true recipe that will satisfy all chocolate lovers’ cravings. Made with a perfect combination of a moist pecan and coconut filling and chocolate butter cream, you will not want to miss out on this special cake. Whether you pick up a cake to share with others, or choose a German Chocolate Cake Cupcake ($2.49-3.00) for your own delicious consumption, make sure you get your hands on this rich treat on June 11. The German Chocolate Cake, as well as other baked from scratch cakes and pastries, can be found at all three Delightful Pastries locations: Old Town at 1710 N. Wells St., (312) 255-0724; Jefferson Park at 5927 W. Lawrence, (773) 545-7215, and Chicago French Market at 131 N. Clinton, (312) 234-9644. Visit http://www.delightfulpastries.com for more information. serving up its unique take on lobster rolls and other lobster delights. The truck will be all over the area, from downtown, through the neighborhoods and even in the suburbs. You’ll also start seeing it at street fairs and festivals throughout the area. 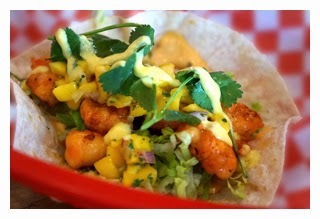 Da Lobsta’s food truck promises to raise the bar for food trucks in the Chicago area. "Until now, food trucks have offered quick, inexpensive meals and treats to go, at a very low price point," said J Wolf, Da Lobsta’s owner and founder. "These foods definitely have their place, but the Da Lobsta truck will be different—we’re offering upscale food at a higher, but still reasonable price point. We believe that Chicagoans are ready to enjoy better quality and more creative fare from food trucks. Our delicious lobster rolls, sandwiches and other items are designed to appeal to food lovers who have been craving a great lobster experience at an affordable price. We’re excited to be leading the way with this new level of food truck service." The past year has been a very successful introductory period for Da Lobsta, which has established two popular locations in Chicago. "Because the demand for our products has been so high, we chose to launch a food truck so we could reach a wide audience while familiarizing more and more people with our brand," said Wolf. "The truck will give us important experience in this important new sector of the business." Da Lobsta’s food truck is poised to raise the standard for food trucks in Chicago. It will be the first to serve upscale food rather than fast food and snacks from a food truck, and yet the prices will be very reasonable. To find out where the Da Lobsta Food Truck will be, follow their special Twitter feed at #finddalobsta. Da Lobsta earned more than $1 million in year one with its two locations, 12 E. Cedar and 131 N. Clinton at the Chicago French Market. To raise the capital needed to build and equip the truck, Da Lobsta turned to Bolstr, a marketplace where successful local businesses access growth funding to scale. The Bolstr campaign was such a success that the needed funds were raised in only four days. "People know a good thing when they see it, and so we’re weren’t surprised that we raised the funds, but we were overjoyed, to say the least, when it took so little time," said Wolf. "We are proud that Chicagoans have such confidence in us, and we will do everything we can to make this a smart investment and a successful avenue for building our growing community of fans." "We were first to the market by offering an upscale lobster roll product at fast-casual prices, making it affordable for the masses," said Wolf, founder and owner. "We knew Chicagoans love their lobster and there was pent-up demand for lobster served at an affordable price. 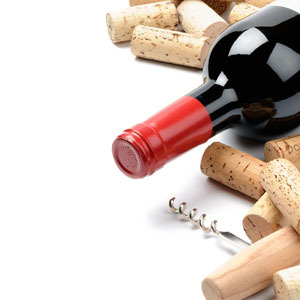 We have solved the riddle as to how to do it really well at a reasonably low price point." Da Lobsta’s Lobster Roll sandwiches are priced at $12.95, and they have clearly raised the bar. Da Lobsta fans can still enjoy all of the great menu items at the two "bricks and mortar" locations, but soon Chicagoans will begin to see enthusiastic lines of people standing alongside the Da Lobsta food truck, waiting to enjoy their delicious goodies in the fresh air of summertime. 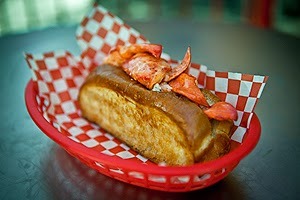 For more information about Da Lobsta and to view the menu online, please visit the website at www.dalobstachicago.com. Delightful Pastries’ The Thanksgiving Sandwich ($8.25-8.95) will have you dreaming about turkey all year round, not just at Thanksgiving. Since June is National Turkey Lover’s Month, now is the best time to get your hands on this salivating sandwich. 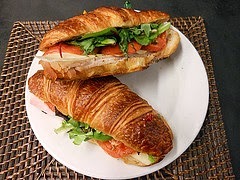 Made with turkey breast, Swiss cheese, Dijon mustard, homemade horseradish, mayonnaise, cranberry sauce, tomato and field greens, all sandwiched between your choice of Delightful Pastries’ homemade butter croissant, seven grain bread, and sunflower rye bread. For the perfect summer picnic, stop by any of Delightful Pastries three locations and grab The Thanksgiving, and any of their desserts, and head to the beach or park for a great outdoor meal. The Thanksgiving and other enticing Café items are all available at the Wells Street location and Chicago French Market: Old Town at 1710 N. Wells St., (312) 255-0724; and Chicago French Market at 131 N. Clinton, (312) 234-9644. 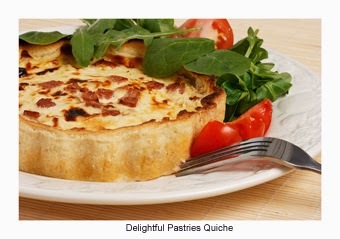 Visit http://www.delightfulpastries.com for more information. June is National Lobster Month and Da Lobsta is All Over It! June is the month to celebrate lobster, one of America’s favorite food cravings. Da Lobsta is the place to celebrate National Lobster Month—and National Lobster Day on June 15—because it’s the fast-casual restaurant where Chicagoans can have their fill time and time again, without breaking the bank. Da Lobsta has mastered the art of delicious yet affordable lobster, and they offer it in so many ways that there is something for everyone throughout the month. The signature item at Da Lobsta is the Lobster Roll, a traditional New England sandwich with big chunks of lobster meat served on a grilled, buttery roll with mayonnaise. But Da Lobsta goes much, much further, with a variety of Lobster Roll sandwiches that are sure to please Chicago’s sophisticated food lovers. Da Lobsta fans can also choose Asian, Mexican, Greek and Indian versions because Da Lobsta’s lobster rolls are inspired by global cuisine. Da Lobsta also serves salads, sandwiches specialties such as the Lobster BLT or the Lobster Grilled Cheese. Comfort food lovers will dive into the amazing Lobster Mac ‘N Cheese.